Bring your pet to Purr’n Pooch for the finest cat and dog salon spa and grooming services. Our professional staff is experienced in all cat and dog breeds. Our cat and dog grooming specialists will effectively clean and groom your pet and never use tranquilizers. We take the time needed to make sure your best friend is comfortable during the entire treatment and enjoys a relaxing experience. We also offer services like teeth brushing and nail clippings. Our competitive rates are based on the breed and condition of your pet’s coat. Express service is available upon request and availability. 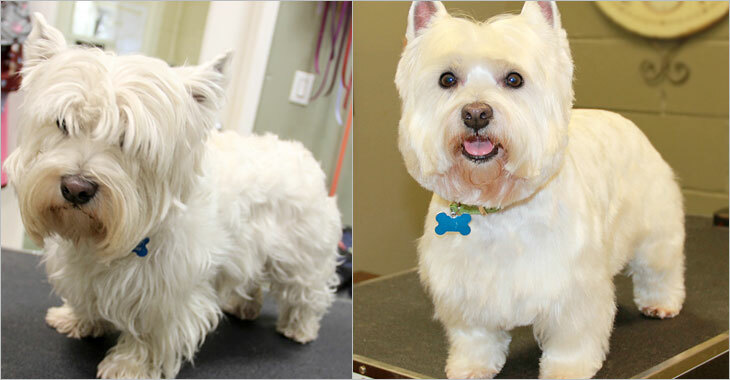 Grooming services can be made by an appointment, or added to any boarding or daycare package. Groomer Suzie Woodley is celebrating more than 25 years with Purr’n Pooch! A seasoned groomer, Suzie is especially passionate about grooming cats and enjoys the challenge of even the most finicky personality. “Cats require different handling than dogs and should be groomed in a quiet, calm surrounding.” Suzie’s standard services for cats include trimming of the undercoat, shaving rear areas of fur, trimming nails and pad hair, baths and ear cleaning. Organic flea and tick bathing. Furminator deshedding and dandruff control. Fur trim to your specifications.